Cerebral hydatid cysts may be classified as primary or secondary. Primary cyst: Primary cysts almost always occur as single lesions. These cysts are fertile due to their content of scolices and brood capsules. Secondary cyst: Secondary hydatid cysts result from surgical, spontaneous, or traumatic rupture of a primary cyst in other organs with hematogenous spread to the CNS. These cysts are usually multiple and infertile due to the lack of brood capsules and scolices (10, 23, 24). High-blood-flow organs: Liver, lung, heart, spleen, and kidney are the most involved organs and must be carefully investigated in patients, especially children. MCA territory: Hydatid disease of CNS is most commonly located in the parenchyma of the supratentorial brain supplied by the MCA, suggesting the embolic nature of the infection. Cerebral intraventricular manifestations of hydatid disease are very rare (1, 12, 21, 23, 24, 28). Large size: Because of the elastic structure of the calvarial bone, its open sutures, and the relatively higher compressibility of neural tissue in children, hydatid cysts in the brain can grow to enormous sizes. 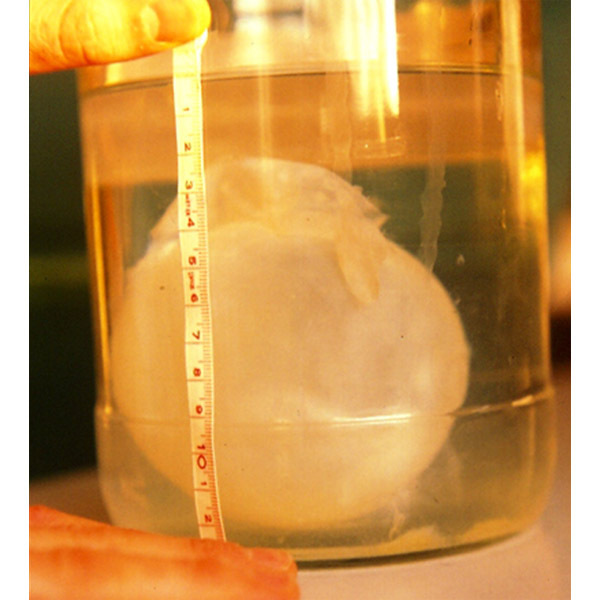 Growth rate: In several studies, the growth rate of the hydatid cysts is reported to vary from 7 mm/month by Altinors et al. (1) to 1 cm/month over a 6-month period by Evliyaoglu and Keskil (21) and to 5 cm/year by Sierra et al. (42) in a patient with secondary cysts. Blood-borne lesions of the spine and spinal cord: Spinal involvement is believed to occur through vertebral-portal venous anastomosis. Infestation of the spine progresses as a multivesicular infiltration of cancellous bone involving the vertebral bodies, pedicles, and laminae to varying extents. The intervertebral disks, however, are usually spared because the cyst growth is confined by the periosteum (41). Spinal lesions: Vertebral involvement is common in the spinal form of the disease, and such cysts have the disadvantages of being microvesicular, invasive, and often multiple in nature (1, 5, 7). A recurrence rate of 40% has been reported for cases in which treatment is delayed, and the incidence of paraplegia due to recurrent disease is reported to be 25–45% (1, 54). Intraspinal lesions: There can be extradural, intradural extramedullary and intramedullary hydatid lesions (55). 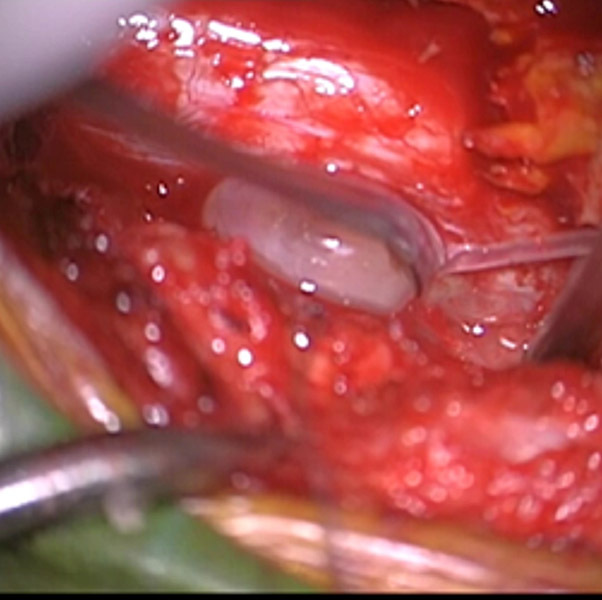 Hydatid cyst in spinal canal: An extramedullary spinal hydatid cyst in an 8-year-old female was dissected and removed (54). Hydatid sand: The cyst fluid or ” hydatid sand” obtained in aspirated specimens consists of daughter cysts and protoscolices, freed by brood capsule rupture, as well as loose hooklets. Inflammation is absent. Characteristic membrane layers: The second layer, the laminated membrane, located immediately beneath the germinal layer, is avascular, eosinophilic, refractile, and chitinous. It is 1 mm thick and nonnucleated. It stains strongly with Periodic acid-Schiff, Gomori methenamine silver, and Best’s carmine. 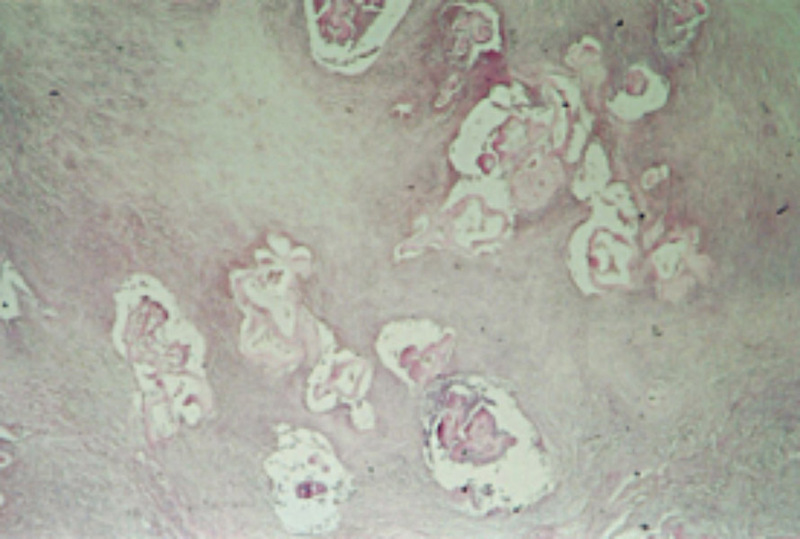 The outer, advential layer (pericyst) consists of dense fibrovascular tissue with a varying number of mononuclear inflammatory cells, depending on the age of the cyst. Cyst: The cysts of E. granulosus are unilocular, filled with white fluid, and enlarge at the rate of about 1–5 cm/year. The cyst wall contains three layers. Its inner or germinal layer has a thickness of 10–25 µm and contains nuclei. Cuticular membrane is followed by laminated membrane, and fibrovascular tissue respectively. Protoscolex: Protoscolices (future heads of the adult tapeworm) develop in the brood capsules. Each protoscolex has a double row of refractile, birefringent, and acid-fast hooklets each 22–40 µm in length, as well as four round suckers. Cyst: E. multilocularis produces an alveolar structure composed of numerous irregular cysts, each with a diameter from <1 mm up to 20 mm. At microscopic level, a thin laminated layer is evident. The germinal layer is frequently absent or attenuated (40). 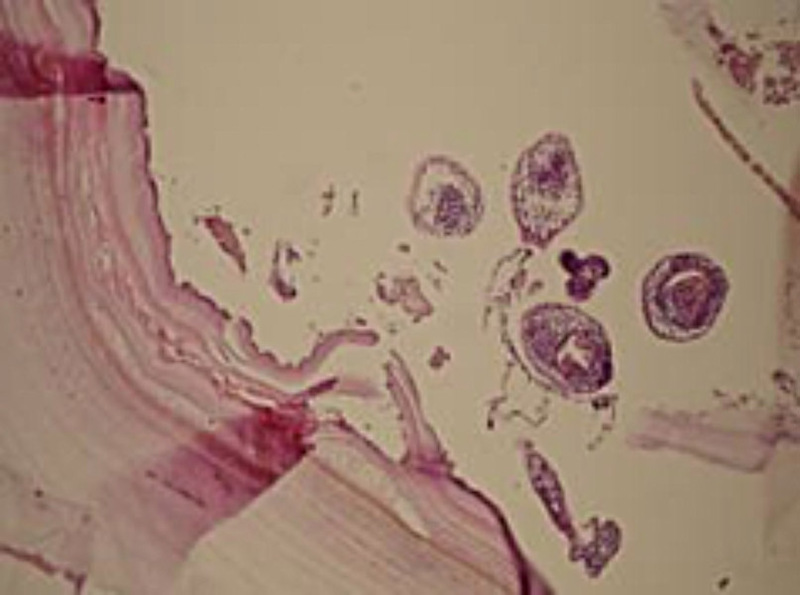 Brood capsule: Brood capsules and protoscolices are seen in <10% of cases.